The Ademola Adeleke Campaign Organisation has reacted to the ruling of a High Court sitting in Bwari Area Council of the Federal Capital Territory, FCT, nullifying the election of Senator Ademola Adeleke as Osun PDP governorship candidate. “We receive with shock and bewilderment the judgement of a Bwari High Court on the propriety of the statement of results of Senator Ademola Adeleke as a contestant for the governorship of Osun state. The judgement delivered today (Tuesday) subverted justice by ignoring four critical evidence to rule against validated facts and submissions. It would be recalled first of all that the matter in question has been addressed by two High Courts ruling ,affirming that in the face of the constitution, Senator Ademola Adeleke is qualified to run for the governorship. 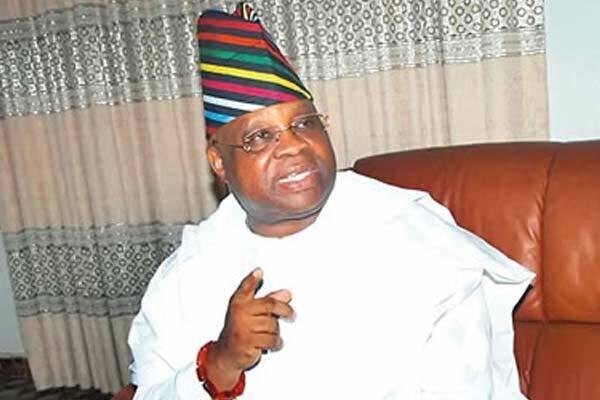 The two rulings delivered in September 2018 held that Senator Adeleke satisfied requirement of the law to contest for office. It is trite in law that once a court of coordinate jurisdiction has ruled on a matter ,court of similar jurisdiction cannot entertain it. Shockingly, the Bwari judge breached this precept to subvert justice. Secondly ,we want to note that the judge erred in law by failing to take note of the expiration of 180 days for ruling on pre-election matters. Even when a December 2018 judgement with respect to the issue was presented, the judge ignored it. We note that the judge violated the law by adjudicating over a matter whose filing and hearing period has expired. Thirdly,the West African Examination Council was also summoned by the court at the instance of the plaintiff to present evidence of facts. The council produced the listing of all students who sat for the May/June examination in 1981 alongside the Senator. The Council produced certified true copies of school results. The Council produced evidence which proved that Senator Ademola Adeleke was indeed educated up to secondary school level as stipulated by law and therefore qualified to run for the governorship, the judge still went ahead to rule otherwise. The WAEC at no point denounced the secondary school qualification of Senator Adeleke. The only statutory body empowered by law to determine authenticity of a secondary results is the West African Examination Council. The Council not only witnessed in support of Senator Adeleke but also presented certified true copies of his school results. What other evidence the judge needs to rule in favour of the Senator is not clear. Fourthly, the plaintiff shocked by WAEC testimony, again filed request that the court compelled the school principal to appear in court to produce evidence of facts as well as to confirm the authenticity of the statement of results. The principal appeared and confirmed that the statement was a product of the school and that any error on the statement was that of the school ,not that of Senator Adeleke. The school did not at any point disowned the statement of results .The school owned up to the error which was not about forgery but alleged false information. From the foregoing, we affirm that today’s judgement of the Bwari court is a travesty of justice, a purchased ruling designed to negatively affect the outcome of Osun governorship legal tussle. We declare unequivocally that the ruling being so glaringly against tested facts and the law cannot stand. It is also clear that the ruling cannot in anyway stop the reality that Ademola Adeleke fulfilled constitutional requirements to stand for the governorship as confirmed by the WAEC, the school principal and previous judgements on the matter.